Most days, there are about 15 people in the group, with adults, children, solo travelers, and friends. Meet us at the Bubba Gump Restaurant Bus Parking Area at 2:00 PM. There is a snack bar at the Park. Meet a local airboat guide and go deep into the wetlands, speeding through waterways and stopping to see wildlife. As you explore the sawgrass marsh, you may see alligators, turtles, and exotic birds. 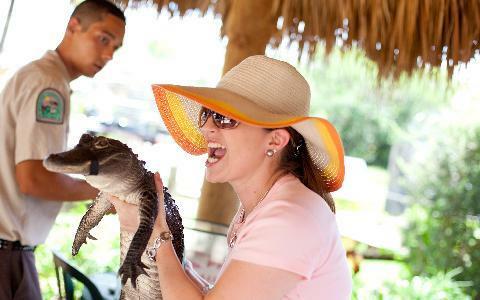 After the airboat tour, you'll watch a wildlife show, where you can meet and greet exotic animals – from gators and snakes to raccoons and panthers. This family-friendly adventure blends education, beauty, and safe thrills, earning glowing reviews from guests. After the tour, we can drop you off at a hotel in Miami Beach, if you wish. Return to your pick-up point at approximately 5:15pm. We booked a tour of the Everglades with an airboat ride and alligator show. It was reasonably priced at $125 for two of us. The company has several pick up locations, including several hotels. The bus arrived on time. It was in excellent condition and very comfortable. The bus driver Danielle was polite and super informative and an excellent driver. The drive to the Everglades was about 30 minutes from downtown Miami. We arrived at the Everglades and had an excellent guide on the air boat ride and saw lots of alligators, birds and turtles. Our guide was very informative about the area and the flora and fauna of the area. There was a brief alligator show that was fun. There is a restaurant, rest rooms and gift shop at the Everglades location. The bus was there for us after the show and returned us to our hotel. Excellent company to deal with. I would recommend any of their tours as I am sure they are as well run as this one was. What a great you're. This was an immersive experience from the bus ride to the actual base at the everglades park. Although it appears a small roadside operation, it was a very engaging and heartfelt experience. Our guide Kennesaw or "Kenny" for short was the best. Please do yourself a favor and have a go at this one. Love every minute of it including the wildlife spotting. Fantastic experience in the Everglades! My girlfriend and I visited the Everglades by booking through Miami Tour Company. We caught the tour bus in downtown Miami. We left nicely on-time and were welcomed with a much needed chilled bottle of water (really nice gesture). We had a comfortable journey to the Everglades, and on our arrival our driver even offered suncream and mosquito spray which was really thoughtful. From the bus we made our way to the boats, everything ran very smoothly. The tour was very enjoyable. The driver spent the time to tell us about the environment. He also stopped the boat to point out the local wildlife and explain some interesting facts about them. Afterwards we had plenty of time to watch the show, have a walk around some of the Everglades, and have a snack. The bus picked up and headed back into Miami. Great team, very funny and entertaining! It was everything like described. 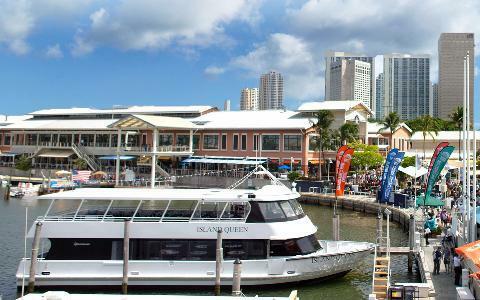 I had a great day with the Miami Tour Company. Maybe sometime again. It was such a great tour and fun time. We did the afternoon everglades tour, it was about a 40 minute bus ride, a 30 minute boat ride and a 25 minute show. Definitely worth the trip! Imho, the Everglades are quite overrated but we did get to see numerous alligators during our visit. The tour was very well managed, on time and well staffed. Driver was very organized and courteous. I would take another tour with the same company, just not to the same location as there was little to see besides the reptiles. This Everglades trip was fun! It’s a quick thing to do if there’s a could day on a nice afternoon. Ride was pretty quick, about 30 mins there and then about 30-45 mins on the airboat which was a blast. After that there’s a gator mini “show and tell” that’s bout 15 mins and you can get a photo holding a mini gator! Recommend! I found the Miami Tour Company to be very professional, they called to confirm my booking the day before. The actual tour was excellent, but the main benefit for me was the hotel pickup and the cost which were both superb. I didn't have a car so getting to the Everglades to do the airboat was going to be a challenge, but it was simple and the cost was very reasonable so I'd highly recommend using them. Thanks! Can I book this tour with my hotel concierge? Will you take me back to my Bayside after the tour?